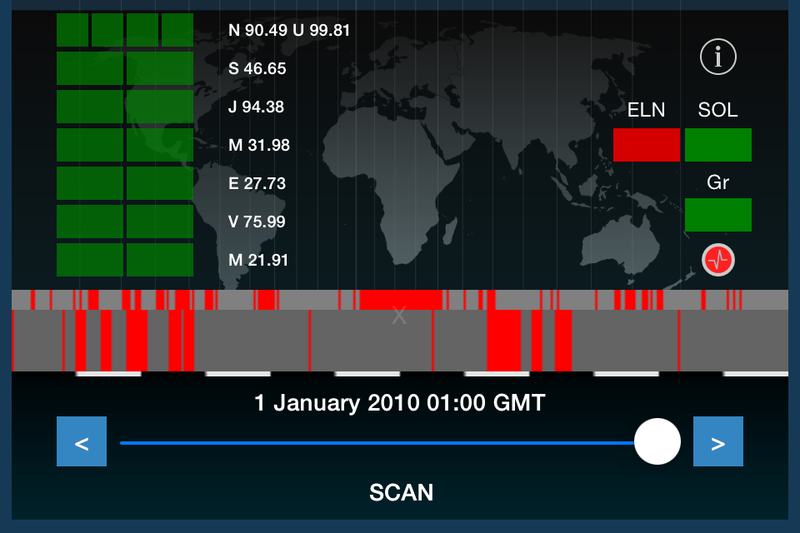 Quakescanner is an Earthquake and Natural Disaster Prediction Tool Based on Solar Tidal Activity and Planetary Alignment. Available for iPhone and iPad devices. 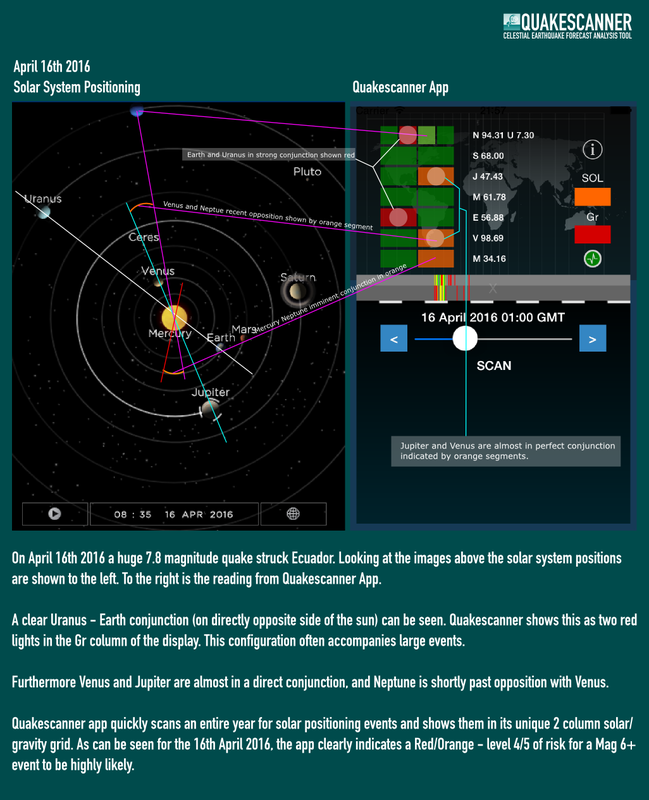 Quakescanner is an easy to use mobile app for iPhone and iPad that models the solar system and predicts solar activity and quantum gravity distortions caused by interplanetary alignments that may trigger significant seismic activity and extreme weather. It is designed to be easy to use for anyone of all levels of expertise. Now anyone can track the planets and discover the correlations of planetary positions and events on Earth. From earthquakes to volcano eruption and massive storms. Quakescanner does not require an Internet connection to operate. I did this because I want it to be available to as many people in as many countries as possible. Many developing nations who suffer worst from earthquakes and natural disasters cannot afford Internet access. By making Quakescanner stand alone, these users can still obtain prior indication and as the app develops this will not change but only improve. 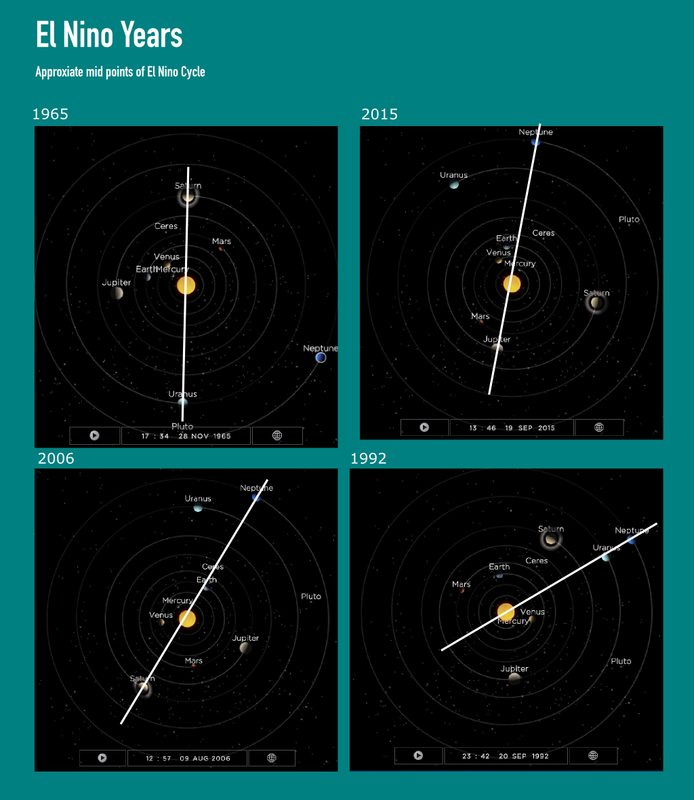 Quakescanner delivers 50 years of solar system big data to your hand and using its auto scan features you can identify planetary and solar/earth/planet alignments in seconds. Quakescanner hopes to help the user identify a reliable time window of when magnitude 6+ or M6+ events are most likely to occur. It allows the user to scan from Year 2000 to Year 2050 and so cross check the results from the app with your own data from reiable sources such as USGS. On the whole, Quakescanner has a very encouraging track record of identifying dates over the 2000-2016 period. All the work I do on developing software for better prediction of earthquakes is funded by me and you the people who buy the Quakescanner app. Buying Quakescanner is the most simple and most efficient way of helping me continue my work. Without you, I cannot hope to achieve what I think is achievable. I want to make the technology available to as many people in the world as possible and if I could, I would do that for free. Unfortunately I cannot and so rely on your suport in the form of app purchases. PLEASE PLEASE share Quakescanner with your friends on social media or email by sharing or sending them this page. Even if you do not live in a high risk earthquake region, your purchase will help fund ongoing research and development into earthquake prediction that could potentially save lives. 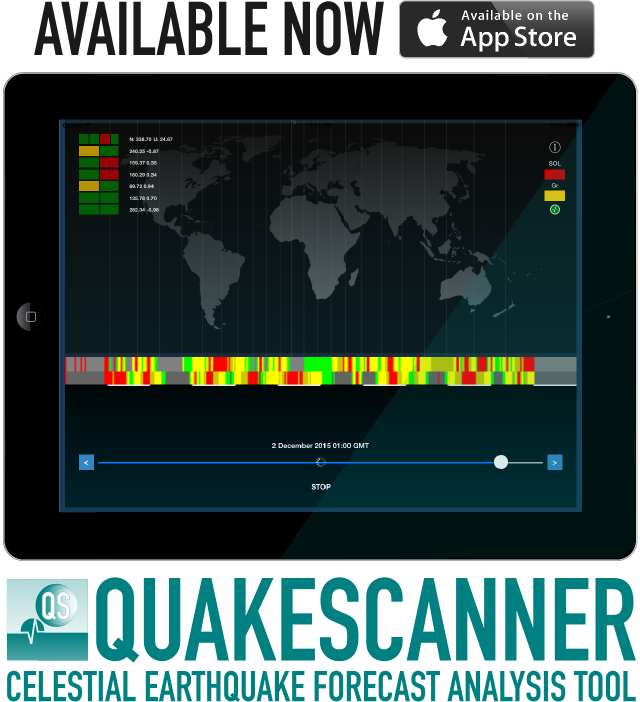 Helping is as simple as clicking the link and downloading QUakescanner from the Appstore. Quakescanner currently contains no previous data on earthquakes at all. This means that the risk result you see is calculated purely from gravitaional tidal models in the app based on planetary alignments. So in case you think the Y2000-2050 data is pre programmed, it is not. I want your experience with using Quakescanner to be one that you enjoy and find compelling. With proper use, Quakescanner will become an invaluable tool in your earthquake prediction tools arsenal. Quakescanner has a dedicated support page that explains the controls and common ways to use the app for earthquake prediction. Access the Quakescanner support page here. The theory is simply that positions of the planets have a direct effect on both the Earth and the Sun in much the same way as the Moon is documented to move the surface of the Earth by as much as 40cm every day. I personally undertook a detailed investigation and analysis of major seismic events and damaging storms and how they correlate to planet positions, solar tides and solar activity before and during such events. For me the results spoke for themselves. I found that during or leading upto/immediately after a great number of major seismic and solar events, one or more pairs of planets were in strong conjunction or opposition. Further more, some planets configurations seemed to be particularly present during the largest of these events. When you begin to add modelling for actual solar tidal forces with high accuracy for long periods (decades) and analyse this data with machine learning algorithms, many relationships begin to become apparent. Quakescanner models several configurations of solar tidal forces in conjunction with alignments and predicted solar activity to identify periods of time when larger eartquakes and global disaster events are statistically most likely to occur. Are you saying that only the sun and planets can be used to predict earthquakes then? No, absolutely not! Quakescanner is best be used in conjunction with realtime seismic monitoring sources like the USGS and others. Clearly, it is well know that often one quake leads to another and another in some regions. The techniques used by the seismic surveys are equally inaccurate at times (perhaps even more so). What the theory is really suggesting is that the planets do play a part and may through a series of successive strong tidal stresses actually be the final push that is required to push an already fragile area over the edge. After all we are quite happy with the idea that the Moon raises the Earths surface by as much as 40cm daily ... Do you really think that has no consequence? When a hurricane coincides with a high ocean tide, the resulting destruction is always greater. So from my perspective, an already active month geothermally and seismically, followed by a period of strong planetary tidal forces is very much more likely to produce or possibly prevent a significant event. I say that sometimes strong tidal stress may prevent an event because it stands to reason and physics. If an region was moving in a particluar direction that would lead to a quake, surely a pull or push in the correct direction might equally prevent such an event as much as assist it? There are many who would say that the planets have little to no effect on the behaviour of the Sun and in turn the Sun has little effect on earthquakes and climate here on Earth. Whilst it may be true to say that exact correlations are few and far between, what is clear is that the planets can and do have an effect on solar tidal forces. The image below is a daily plot of the solar tides as a result of the motion of the major planets as far as Neptune (lower graph) and the observed mean daily sunspots as observed and published by official channels in Belgium. Clearly the solar tides follow the solar activity? With an approximate period of 11.5 years the solar high tide preceeds solar maxima by approx 3 years. 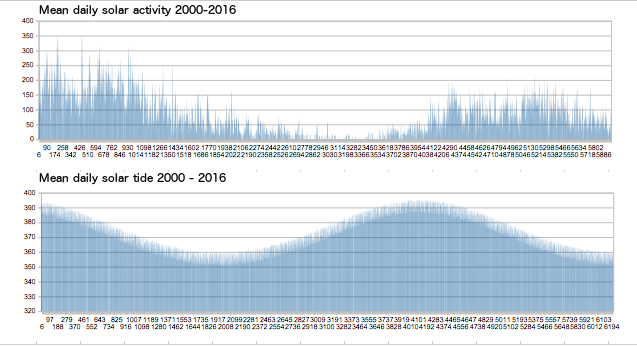 The data below is every day from Jan 1 2000 to May 3 2016. Whilst the exact causal nature of the correlations remain a matter of opinion (personally I come from a Superfluid model of Gravity), what is clear is the correlation exists and has done for the last 200 years of observations. In a superfluid gravity model the longer orbits of Neptune, Uranus, Saturn and Jupiter act as amplifiers of the more rapid cycles of Mars, Earth, Venus and Mercury modulating the tidal strengths on the Sun either side of the 11.2 year overall sun spot cycle. Quakescanner has these tidal models built in to allow the user to determine when tidal strengths are both high and low, also the app detects fast deviations of solar tides due to the perturbing effect of Venus and Mercury which have been correlated to preceed large earthquake events. The math is hard but if you imagine stretching a deflated balloon until it is almost tearing, and then pricking it with a pin, the tiny force of the pin would cause the tension to let go. This is a simplistic way of thinking about tidal perturbation. The tension is there (changing slowly) but rapid changes in minor planets orbits can cause the overall tension to change rapidly. This causes a fast change in tidal force. Because Newtons third law tells us that two bodies exert the same force on each other (so Saturn exerts a Saturn size force on the Sun for example), these changes may cause changes in gravity and also solar activity that send billions of tons of high energy plasma towards Earth causing widespread problems. Whilst no one has put forward a theory of gravity that makes sense, the field is open. Let's face it, we have only just discovered new dwarf planets in the solar system! How does Quakescanner help me make predictions? Keeping track of 7 planets, the Sun and the Earth is hard enough for most people. Manually trying to calculate what planets are aligned and at what time is time consuming and error prone. 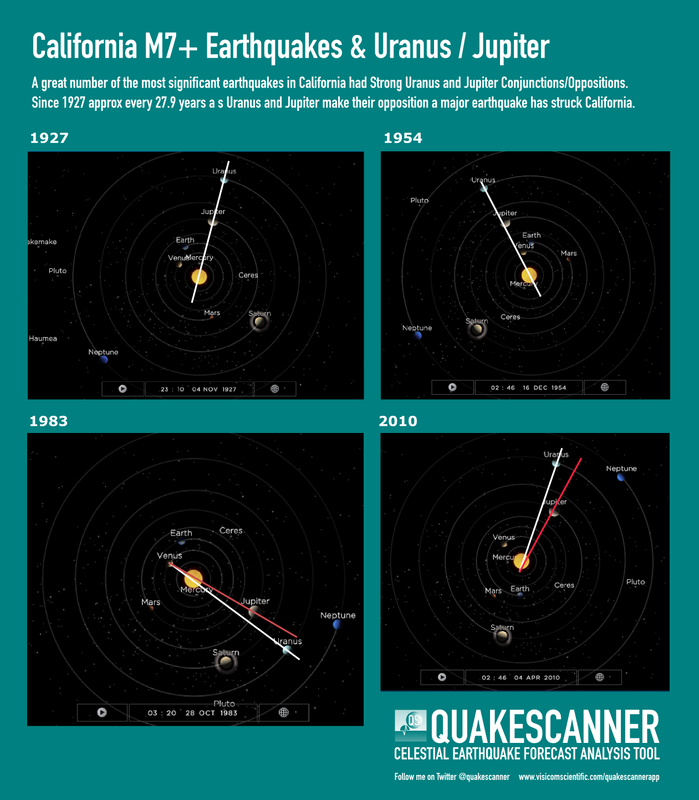 Quakescanner can scan an entire year of the life of the solar system in a matter of seconds and build a hotspot readout that shows you when these alignments occur. This brief video give you an idea of how easy Quakescanner is to use. Table below is a modified extract of earthquakes of M8 or greater since the year 2000 through 2015. Click here to download this data from USGS yourself. Quakescanner V1 was operated in the sensitivity 1 mode for all dates and then progressively increasing sensitivity to 5 in cases where Quakescanner failed to register a risk on the given dates. Looking at the table it can be seen that for 47.62% of the M8 dates Quakescanner indicated a very high risk for the exact date and so paused scanning on the exact correct date. Of the dates that Quakescanner did not identify as very high risk, the nearest high risk date (before the event) was determined for a level 1 scan. 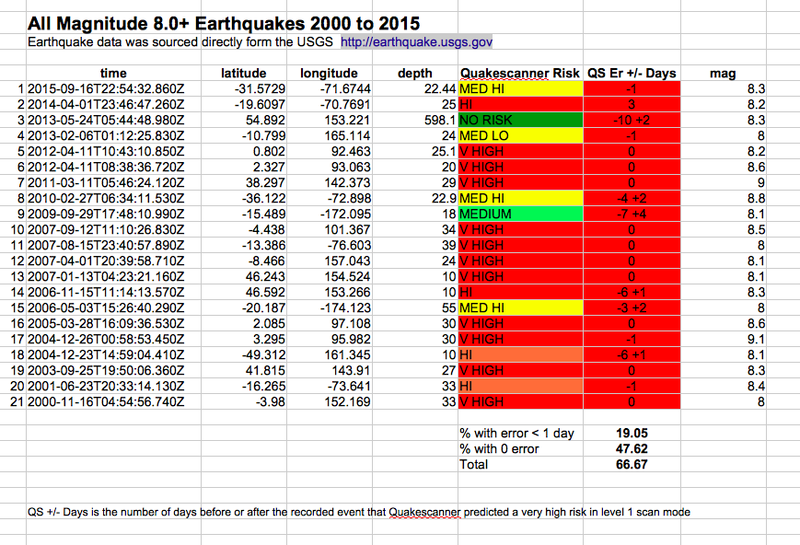 As the table shows, Quakescanner had predicted the event 1 day early in 19% of cases. In brief, Quakescanner had a 66.6% sucess rate of matching Magnitude 8+ events with the positions of planets and the earth on those dates, giving at least 1 day prior warning. Dates where Quakescanner failed to predict before the event withn 1 day were considered failures, however of the remaining 34% of dates the prior warning never exceeded 10 days with a range of -3 to -10 days. The column QS Er =/- Days is the days before and after that a major event risk was predicted by a level 1 sensitivity scan. 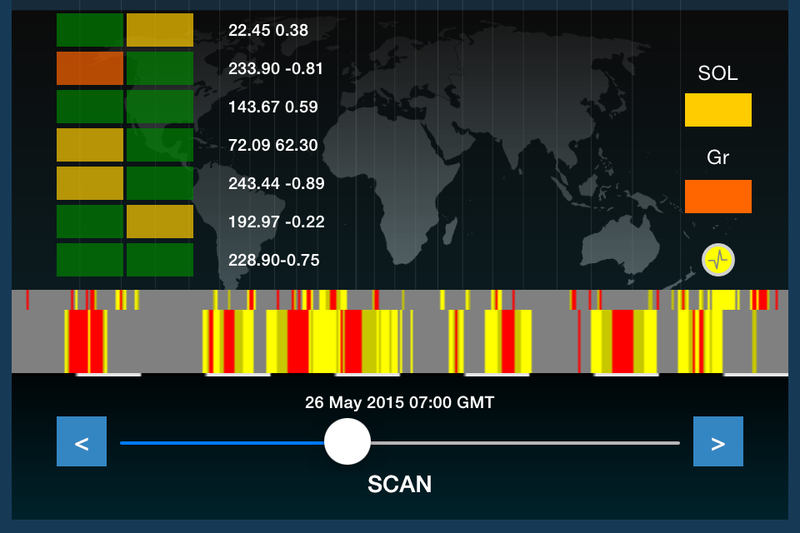 Only for 1 event in the 15 year period did Quakescanner register no risk on any scale. The app is now almost complete and should be in the appstore very soon. As soon as it comes available you can View on App Store. If you would like me to email you as soon as it becomes available please drop me an email via the contact page. During April I have been upating this page http://www.visicomscientific.com/page/Are-We-Closer-Than-Ever-to-Predicting-Earthquakes with predictions and information. Check it out and read how Quakescanner helped predict the risk of all 3 Japan eathquakes a week before they happened. As of April 25th 2016 all updates and predictions have been moved to the new Quakescanner blog and update page here. Do the planets affect El Nino years? Do the planets affect El Nino years? I have complied 8 solar system positions for 8 separate El Nino years. The images below show the relative positions of the major planets Neptune, Uranus, Saturn and Jupiter at the approximate mid point of the El Nino cycles. By and large the correlation seems impressively on point, though of course as chaos reigns some exceptions to the rule still evade analysis. Particularly data on the 1925/6 El Nino is not in line with predictions from this model. Even so in my opinion it is not warranted to ignore the significantly high numbers of El Nino years that can be predicted by using planets and their relative positions. When used to augment realtime solar data and terrestrial data it could prove to be a very accurate way to predict these forces of nature that are responsible for so much havoc globally. I have now added El Nino prediction based on these models to the app and after testing the feature it was able to reliably predict perfectly every El Nino year from 2000 to 2016. I hope to make this a part of the next update. Sorry this wont make the V1.0 release due this week but unless there is good reason it will be added to the V1.1 update release that will goto te appstore shortly after general release. 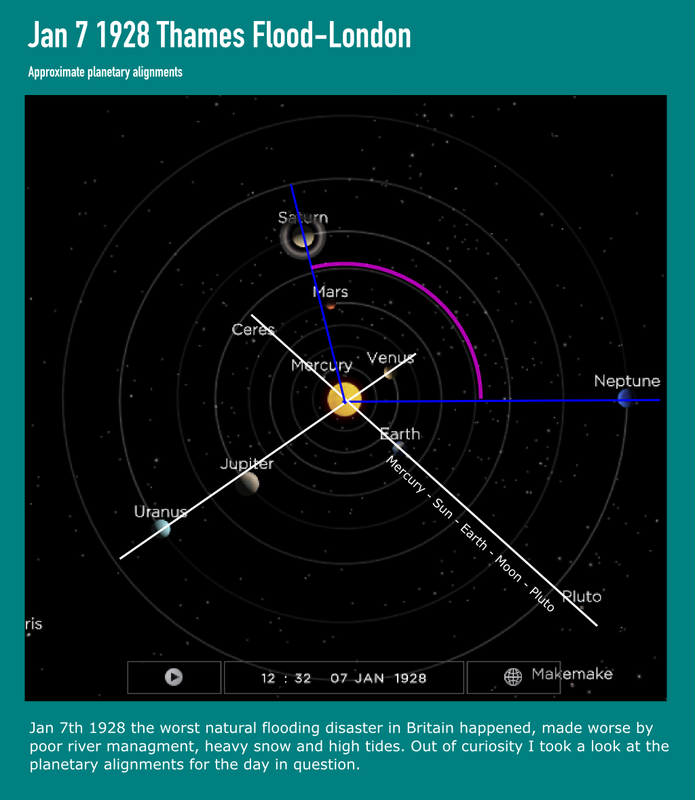 The image below shows the approximate positions of the major planets at the time of the 1928 Thames Flood. For the interested, a hugely detailed breakdown of this from a Sumerian through Egyptian astonomy perspective is provided by Rush Allen on his website here. Click here for a list of all M5+ earthquakes to have hit California from 1900 through 2016. California is one of the most populous regions in the world. It aslo happens to be next two two of the most destructive fault lines on earth. Much talk is devoted to trying to predict when a significant event will be seen in the region. I looked back at the last 100 years of M6.8+ events to see what the solar system was looking like around those events. What stood out to me most strikingly, was the position of Uranus and Jupiter for many of the largest events. On approximately 27 year cycles Uranus and Jupiter oppose each other. This opposition lasts for over a year. 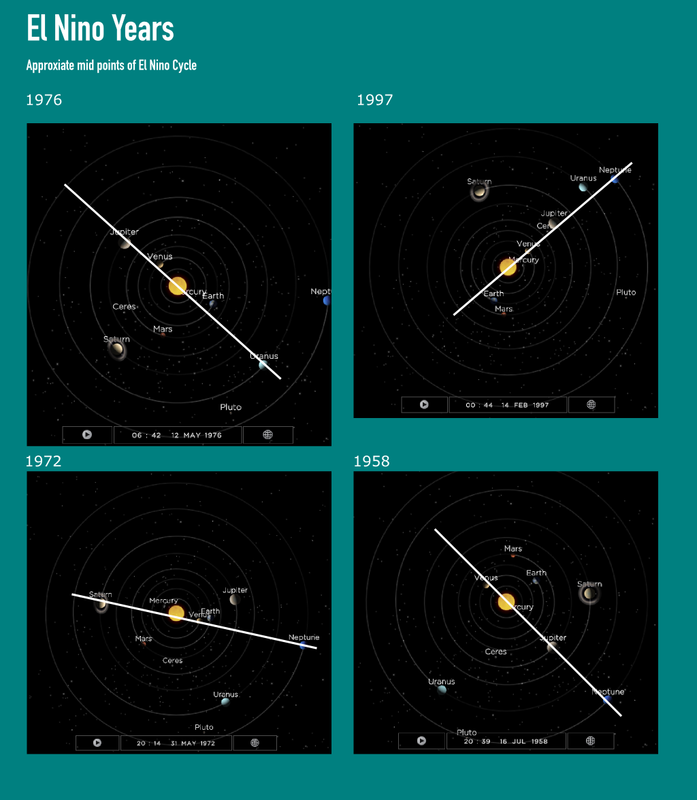 the 1927,1954,1983 and 2010 M7+ events all occured during a Uranus and Jupiter passing. Click here for a useful list of large magnitude quakes in California since 1812 through 2014. Sunspot data 1800 until now "Source: WDC-SILSO, Royal Observatory of Belgium, Brussels". PLEASE NOTE THAT THE RESULTS PROVIDED IN THE APP ARE FOR RESEARCH AND INFORMATIONAL PURPOSES ONLY AND WHILST EVERY EFFORT HAS BEEN MADE TO ENSURE ACCURACY THEY SHOULD NOT BE USED TO MAKE ACCURATE PREDICTIONS AND EVALUATIONS. THE USER SHOULD ALWAYS CONSULT OFFICIALLY PUBLISHED ADVICE REGARDING SPECIFIC HAZZARDS AND WEATHER CONDITIONS IN THEIR REGION.